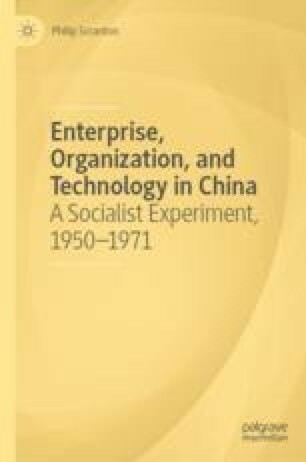 In 1950, what remained of China’s steel, machinery, and metalworking industries had all been constructed by foreigners. The USSR stepped in during the 1950s to sponsor and equip over a hundred new plants, but operating and maintaining them proved a nightmare until sufficient numbers of experienced workers emerged. “Horror stories” will be recounted: of machinery destroyed for want of lubrication, of raw materials and spare parts decomposing in storehouses, or of workers’ shop-floor shortcuts gone dreadfully wrong. “Light” industry (textiles and ceramics) employed antique machinery left over from UK and Japanese mills. With state capital prioritizing “heavy industry,” its managers and workers had to improvise repairs and workarounds that would keep factories going and meet plan quotas. Millions of handicraft workers faced difficulties in getting raw materials, a problem solved by joining experimental cadre-led co-ops which contracted for marketing and payments while seeking hard-currency-generating fine goods. Both heavy and light industries often met quantity targets by ignoring quality. Tales of ingenuity compete with accounts of regrettable pratfalls for attention here, but the larger story concerns cultivating bottom-up innovation through encouraging and rewarding worker initiative.